The narrator of Monsters by Emerald Fennell is an unnamed 12-year-old girl, orphaned a few years previously but not remotely saddened by this. She now lives with her grandmother, who appears to be a wholly inadequate guardian, and spends her summers at a slightly down-at-heel hotel in Fowey, Cornwall owned by her aunt and uncle, who openly find her a burden. It's fascinatingly unclear whether people dislike her because of her undeniably unpleasant behaviour, or whether her behaviour has been shaped since birth by the constant emotional neglect and dysfunction of the adults around her. Either way, she is now on the cusp of adolescence, utterly disdainful of everyone she meets and prone to small but significant acts of malice. Unsurprisingly, she is also friendless - until one day a boy her own age arrives in Fowey for a holiday with his creepily overbearing mother. 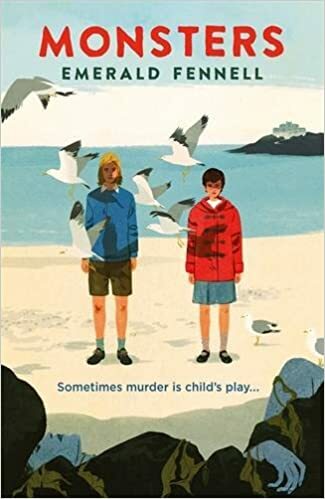 United by a shared obsession with serial killers and a distinct lack of moral compass, the narrator and Miles are naturally delighted when the body of a young woman is dragged from the sea, and the murder becomes the focus of their increasingly sinister games. The plot of Monsters could certainly have become the stuff of a dark psychological thriller, and yet Emerald Fennell has chosen to imbue the story with a coal-black thread of comedy and a strange sense of heightened reality that turns it into something quite different - Fowey is like a seaside town reimagined by The League of Gentlemen and none of the cast would be out of place in a Roald Dahl novel; moreover the plot becomes increasingly bizarre towards the end as the mystery is resolved. Yet underneath the witty observations and the often grotesque cast of larger-than-life characters there is a strong undercurrent of genuine horror and flashes of sadness that often come from what the narrator doesn't tell us, rather than what she does. There were many things in Monsters that I found very funny, but equally there were many moments that I found uncomfortably disturbing. Such is Fennell's skill that there are also moments where it's impossible not to feel sympathy for the narrator, despite her many nastier traits - this is an author who knows when to crank up the horror and when to plant intriguing seeds of ambiguity. This is an extremely cleverly-written novel, chilling, grimly funny at times and frankly not quite like any other book I've ever read. I think it's fair to say that it absolutely will not be for everyone (the appalled reaction of some Goodreads reviewers should be noted) and I'm not entirely sure who its intended audience is, but I found it an original and entertaining read. One of my favourite books of the year.